This was a delicious fall meal, and I might just prepare it again on Thanksgiving to celebrate this year’s harvest. Cut the quince in quarters or eighths. Peel the skin off and place in a small pot with water and 2-3 tablespoons of sugar. Bring the mixture to a boil then turn it down to a slow simmer. Cook the quince for about 45 minutes or until soft. We used an organic uchi kuri or Hokkaido pumpkin, any other pumpkin or butternut squash will also be good. As the organic Hokkaido has thin edible skin, it could also be used. Cut the pumpkin in small bite sized pieces. Keep the seeds to plant next year, or clean and toast as a sack or garnish for soups and salads. When the oil has heated, add the onions and begin to saute. Add the pumpkin pieces and saute for 3 to 5 minutes. Add the risotto rice and also saute for 1 minute or until glassy. Add 1 cup of the vegetable bouillon and turn the heat to simmer. Add the sage and garlic. 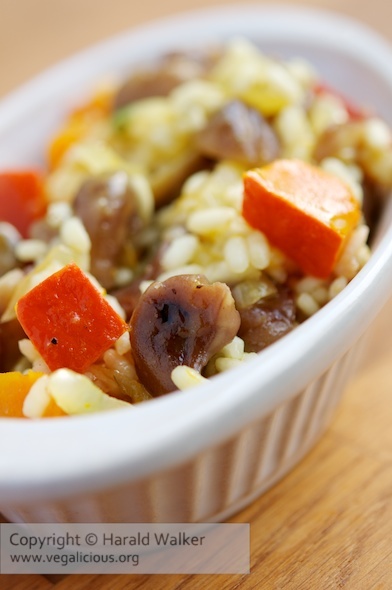 Stir the risotto often to avoid sticking and evenly cook. Add the 2nd cup of bouillon when needed. Add the chestnuts and the glass of white wine. 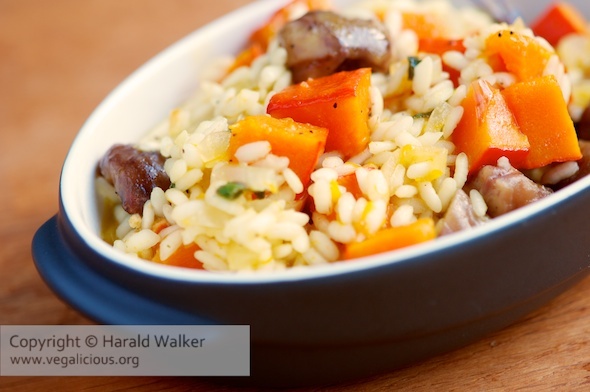 When the risotto has become soft and the mixture has absorbed the liquid the meal is ready. If the risotto is still hard, add the 3rd cup of bouillon and allow to cook until the liquid is absorbed and the risotto is soft. Shortly before serving add the optional cooked quince pieces. Posted by Chris Walker on November 4, 2010 in Main Dishes, Pumpkin, Quince, Rice.